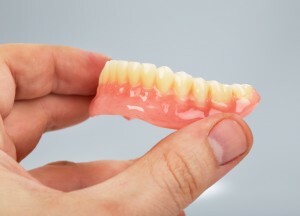 You want your dentures to last, fit well, and look great; the only way to accomplish this is to ensure that they are cared for properly and regularly. At D’Amico & Mauck, DDS in Aurora, CO, Dr. Nicholas D’Amico and Dr. Matt Mauck offer our patients helpful information regarding all aspects of restorative dentistry, including how to properly care for their dentures, partials, and other dental prosthetics. Here are some simple tips that can help you keep your dentures in optimal shape for years to come. Always handle with care. Your dentures are crafted specifically for you using high-quality dental materials, but they can still be damaged. When you remove your dentures, do so over a folded towel or a sink full of water. This will help prevent breakage if they should be accidentally dropped. Clean daily and after meals. Rinsing your dentures after eating will help prevent the buildup of plaque and odor-causing bacteria. Every night, remove your dentures and brush them with a special brush and cleansing agent designed for cleaning dentures; regular toothbrushes and toothpastes can be too abrasive and actually cause unnecessary damage. Store dentures properly. The way you store your dentures when you are not wearing them is extremely important. Dentures must be kept moist so that they maintain their shape, so keep them in a container of specialized soaking solution or water. Never place your dentures in hot water, as they may warp and will no longer fit properly. At D’Amico & Mauck, DDS, we believe that every patient deserves to experience the full benefits of a healthy, happy, and beautiful smile. Contact our office in Aurora, CO today to schedule your appointment with our experienced doctors and caring staff. We look forward to showing you what a difference our dedication and skill can make in your oral health and in your life. Our conveniently located dental practice happily serves patients from throughout Aurora and the surrounding areas, including Englewood, Parker, Centennial, Denver, and beyond.